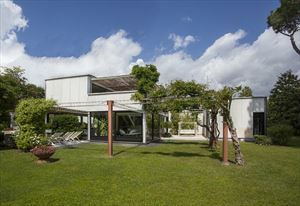 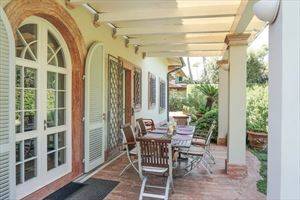 Outside there is a double veranda furnished with a dining table and deckchairs with a sunshade, and a rocking bench. 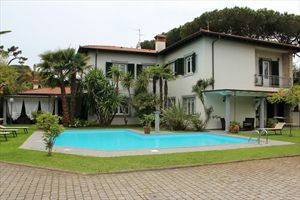 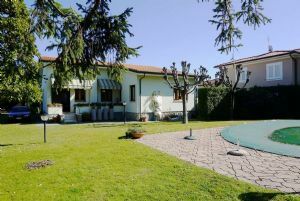 Inside there is a large and bright living room with dining room and sofa room and spiral stairs leading to the first floor, kitchen with double access, also outside, a bathroom with a small bathtub, a twin bedroom for staff and the guest bathroom. 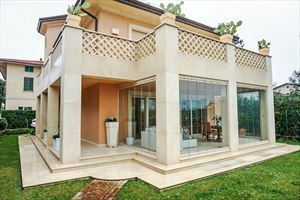 The first floor includes four double bedrooms and one twin bedroom, with a terrace surrounding the villa on two sides and three bathrooms with shower. 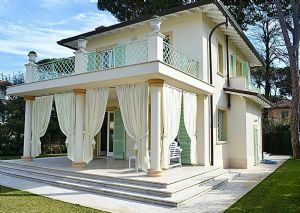 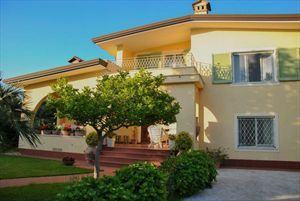 The Villa is also equipped with Wi-Fi Internet connection, alarm system, automatic gate and air conditioning.